My friend David, a walking encyclopedia of Winnipeg urban history, asked me why I had mis-named the park mentioned along the route of the foot race in Put on the Armour of Light. And that reminded me of this photograph and its story. The Archives of Manitoba description of this photograph says, “Assiniboine Park 3 N25”. When I first looked at it some years ago, I said to myself, “There’s something wrong here.” I count at least four houses in the background. But the photo looks as if it dates from about 1905 and at that time, houses would not have been visible from Assiniboine Park, the large suburban city park that all Winnipeggers know and love. Tuxedo, the suburb on the eastern edge of Assiniboine Park, was not developed until the 1920s and 1930s. And also, the style of the plantings and the rustic bench and the bandstand in the distance didn’t fit with the more natural English landscape style of Assiniboine Park. I thought that the photograph had been mis-labelled. I was wrong about that, but it wasn’t until I looked in Henderson’s Directory for 1900, that I found out why. What we know today as Fort Rouge Park—located on the south bank of the Assiniboine River, off River Avenue in Fort Rouge—was originally called “Assiniboine Park”. It was, in fact, the first land purchased by the newly minted Winnipeg Public Parks Board in 1893. 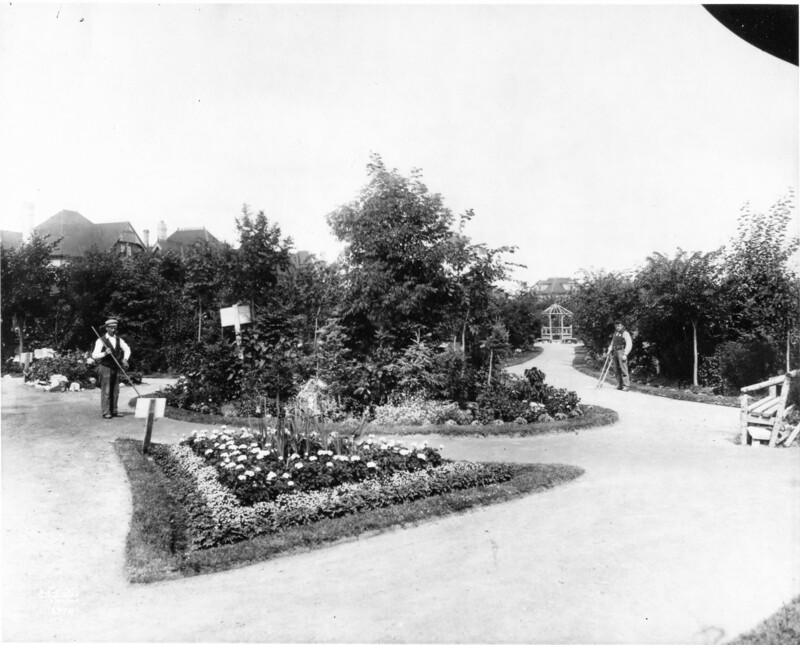 When the land was bought for the large suburban park west of the developed part of the city in 1904, the Board decided to name the new park, “Assiniboine Park”. This meant that they had to rename the existing Assiniboine Park, and so it became Fort Rouge Park. So David was right. The park that my fictional runners run past was Assiniboine Park in 1899, not Fort Rouge Park, as I named it in the book. But I knew my Winnipeg readers would be confused if Charles and Trevor were supposed to be running down River Avenue and all of a sudden they were instantly transported to a place 6 kilometres further west.